The 600cc Sportsbike sector has been one of the most developed and competitive sectors of the motorcycle market. The bike that kicked off the 600cc sports bike sector, also known as 'Supersports', was the Kawasaki GPZ600R (also named the Ninja 600). 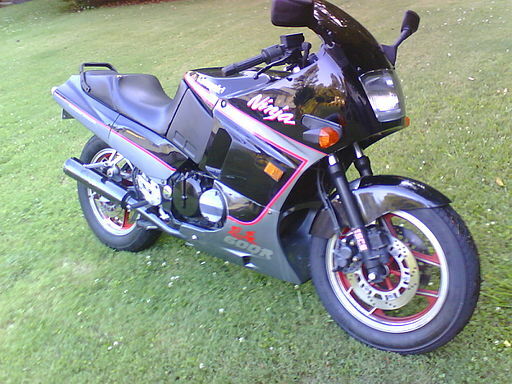 The GPZ600R was launched in 1985 and was the first of the breed. It featured a 592cc four-stroke, liquid cooled, in-line four, 16-valve engine making a claimed 75 BHP - an engine configuration now synonymous with the 600cc sports bike class. In 1986 Yamaha joined the sector with the first of their offerings: the FZ-600. Like the GPZ600R, the FZ-600 also used an in-line four-cylinder engine, however it was air-cooled. This left the FZ-600 at quite a disadvantage, it was 20 BHP down on the claimed BHP of the GPZ600R and as such the FZ-600 was far less of a sales success. By 1987 Honda released the first incarnation of the Honda CBR600. The styling of this bike was definitely to its time and very 80's: picking up the nickname of the 'Jelly Mould'. Jelly Mould describing that the bike was fully encased in fairing: fairing that also covered the steel frame. The CBR600 made more power than the GPZ600R (a claimed 85bhp) and was lighter. It very much gave larger capacity sports bikes of the time such as the Suzuki GSX-R750 a real run for their money despite a handicap of 150cc. Following the popularity of the newly created 600cc Supersports segment, Yamaha upped their game and introduced the FZR600 in 1989; this time having an all important liquid cooled engine allowing Yamaha engineers to produce a more powerful 600cc engine to better compete against its rivals. It wasn't until 1992 when Suzuki joined the other Japanese manufacturers in the 600cc Supersports segment with the GSX-R 600. The GSX-R 600 was based on the GSX-R 750 sharing all of the same components bar a smaller engine of 599cc. The GSX-R 600 as well as the new model of CBR600 (the 1992 CBR600F2), both had engines that were now claiming to produce around 100 BHP. Over the next few years there were a number of variations of the FZR600, the CBR600 and the GSX-R600; all incorporating advances in engine, chassis and braking technologies. In 1995, Kawasaki really hit back against the competition and introduced the first variant of the iconic ZX-6R series, a big step change in performance and handling from the firm’s previous offering. A year later in 1996 Yamaha ditched the FZR600 and introduced the YZF600R Thundercat. The Thundercat was a totally new model featuring a more powerful engine with claimed power of 105 BHP. It would be an understatement to say that the 600cc Supersports segment was getting competitive; it was an out and out war between the manufacturers to produce the fastest, lightest and best handling 600cc sports bike of the class! In 1998 Suzuki, keen to up their game, introduced the GSX-R600 SRAD with both the styling as well as the chassis being loosely based on the Suzuki RGV500 MotoGP bike of the time. 'SRAD' stands for Suzuki Ram Air Direct: an air induction system. Large intakes were built into the sides of the front nose cone forcing air through large air tubes directed straight into the air box. The GSX-R SRAD moved the benchmark further once more. The Honda CBR600 continued to evolve throughout the 90's with three model variations, ending the 90's with the introduction of the CBR600F-X: producing a claimed 110bhp and a serious 18kg lighter than the previous model. The development of the Supersports sector ended the 90's with Yamaha introducing the awesome Yamaha YZF-R6 in 1999. The R6's engine made a claimed 120bhp using similar air induction technology as the GSX-R 600 SRAD and weighed just 169kg. The first incarnation of the R6 was a huge success, raising the bar once more in terms of styling, handling and power. And so the trend of fierce rivalry continued. The 90's finished with the full line up of Japanese 600cc sports bike model names as we know them now: the Honda CBR600, the Kawasaki ZX-6R, the Suzuki GSX-R600 and the Yamaha YZF-R6. In 2000 Triumph entered the 600cc Supersports sector with the Triumph TT600, a market that was previously dominated by the Japanese manufacturers. The TT600 used the standard engine configuration of the 600cc class: four-stroke, liquid cooled, in-line four, 16-valve. However, Triumph brought something new to the class; they were the first manufacturer to adopt fuel injection. Unfortunately, the fuel Injection system had glitches; frustrating owners and receiving negative comments by the motorcycling press. Development of the Japanese models: the Honda CBR600, the Kawasaki ZX-6R, the Suzuki GSX-R600 and the Yamaha YZF-R6 continued through the 2000's. Most notable models that moved the game on further were the 2003 Kawasaki ZX-6R 636, the 2003 Honda CBR600RR and the 2006 Yamaha YZF-R6. The 2003 Kawasaki ZX-6R 636: '636' denoting the engine capacity was the first of the Supersports breed to have a higher engine capacity than the 600cc threshold. The 636 took its styling cues from Kawasaki's MotoGP bike of the time; the Kawasaki Ninja ZX-RR. The higher cubic capacity of the engine provided a useful advantage in torque in comparison with its rivals. However, the 636 was not eligible for racing as its engine was over the 600cc threshold. Therefore, at the very same time Kawasaki produced the ZX-6RR, the RR was essentially the same bike as the 636 however had an engine with a capacity of 599cc allowing it to race in 600cc sports bike and Supersports classes. The 2003 Honda CBR600RR also took inspiration from MotoGP, taking design and engineering cues from Hondas MotoGP bike of the time: The Honda RCV. The CBR600RR featured Honda's Unit-Pro link swing arm as well as an under seat exhaust; it looked like a mini RCV. In 2006 Yamaha launched the all-new YZF-6, with a screamer of an engine redlining at 16,500 rpm! This incarnation of the R6 has received a number of small tweaks over the last decade and continues to be on sale today: showing just how advanced the model was when it was launched. Meanwhile back in Britain Triumph were continually developing their offerings, the Daytona 600 replaced the then ageing TT600, with engine capacity quickly upped to 650cc creating the Daytona 650. Although these bikes were very capable machines they couldn't quite match the offerings of the Japanese competition. However, in 2006 Triumph made a huge leap forward with the Triumph Daytona 675 ditching the in-line four-stroke, liquid cooled, 16 valve engine that was present in previous offerings and moving to an inline 3 cylinder (also known as a 'triple'), four-stroke liquid cooled engine with 12-valves. Despite being 675cc it was allowed to race against 600cc in-line four cylinder motorcycles as it was a cylinder down and met eligibility requirements. The 675 is a hugely capable bike, arguably the first offering in the 600cc Supersports class to equal or even beat the offerings provided by the Japanese manufacturers. The 600cc sports bike market has suffered in recent years. New classes of bikes have grown in popularity, including adventure bikes and modern retro style bikes, as well as the financial burden for manufacturers to develop bikes to meet tougher emissions standards against the back drop of falling sales volumes. Triumph stopped making the Daytona 675, Honda ditched the iconic 600RR but the R6 and GSX-R600 survive for now. The latest crop of 1,000cc and 1,000cc+ Superbikes are incorporating ever more advanced technology such as electronic suspension systems, and increasingly sophisticated traction control and ABS systems. As the technology becomes more widespread, therefore more cost efficient to produce, it is extremely likely that these advances will filter down into a new generation of mid-capacity sports bikes in the future (we hope)!! Call BeMoto on 01733 907000 to speak to a biker about your Triumph Insurance with FREE Legal Expenses, NO fees to make changes and declared modifications covered.